Gutter Guard – Does it work? Have a look at the video to see first hand why…..
What do we specialise in? Why have your building/house washed? What is included in a Building/House Wash? We can also clean your Pergolas, Alfresco areas, Fences, Driveways, Pathways, Bricks & more. 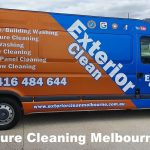 We take care of your property and have the know how on identifying the kind of surface and choosing the best method to deliver a high quality clean. What methods do we use to clean? We’ll advise the best method and offer a FREE quote. The results will speak for themselves. We have the equipment and the know how. We had a great experience with Aah clean, they were very professional and helpful from the very start! They came to clean our windows and did a fantastic job, now our windows are now the cleanest they have ever been, We look forward to working with Sunil again in the future! It was a pleasure dealing with Sunil. He was very friendly, very professional and the quality of work was exceptional. I would highly recommend using Aah Clean. Sunil helped with my roof gutter cleaning on a very short notice, not only he did a great job but also gave me lots of helpful advice, not to mention his complimentary roof check plus before and after photos. Will definitely use again. Service was friendly and of a high standard. My roof is very high but this posed no problem for the capable team. Pricing was very reasonable. I would highly recommend this company. Sunil and his team were great. They were able to clean my gutters and the exterior of my home. Sunil was easy to transact with and very helpful. I highly recommend their service. Sunil and his team are top class! From the moment I contacted Sunil, I received excellent service. Prompt quoting - received my quote on the day I requested it!!!!!! This is almost unheard of! He arrived promptly on the day we arranged and together with his team delivered a top quality job. Very professional and highly recommended service! Very friendly and prompt service. Arrived on time, quoted a reasonable fixed price in advance and providing before and after photos of the gutter clean. I would recommend. Sunil provided an excellent and thoroughly professional service. We will be utilising his services again in the near future and would highly recommend Sunil and his business for all roofing and gutter cleaning requirements.